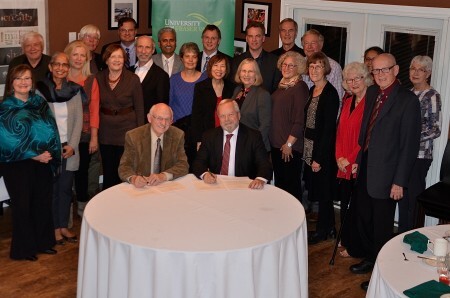 Mennonite Faith and Learning Society and members of several faith communities gather for signing of MOU with UFV President Mark Evered, MFLS President James Nikkel, and UFV faculty and executives. ABBOTSFORD – It was a sweet evening of celebration for the University of the Fraser Valley and the Mennonite Faith and Learning Society (MFLS) at Friesen House, the residence of UFV President Mark Evered. An informal evening of delicious desserts, fellowship, and speeches culminated in the signing of a Memorandum of Understanding (MOU) – one that broadens and deepens the next phase of this important collaborative relationship. Since 2009 the MFLS has supported the development and delivery of UFV’s certificate program in Mennonite Studies and a Centre to support this work. This new agreement brings a renewed commitment to partnership, especially in the development of UFV’s new multidisciplinary and multi-faith program in Peace and Conflict Studies. The evening was enriched by contributions from members of several faith communities who joined the MFLS in their support for this work. Donations for the new program have come from members of a number of faiths and cultures and have already exceeded half a million dollars. The University is awaiting approval from the BC Ministry of Advanced Education for its proposed Bachelor of Arts in Peace and Conflict Studies. In addition to analyzing conflict and approaches to peace in the classroom, students will develop practical skills and gain hands-on experience in conflict transformation and reconciliatory work in the Fraser Valley.